It has the taste & flavor of the southern style entertaining. Whether it is summer or winter. These recipes will soon be one of your families favorites. - In a medium bowl, beat egg and 1/2 cup milk together. - In a different medium bowl combine garlic salt, paprika, pepper, poultry seasoning and flour together. - Dip meat in egg and milk mixture then coat in flour mixture. Then repeat this one more time in egg and milk mixture. then coat in flour mixture. - In a large skillet, Heat oil to 365 degrees F (185 degrees C). 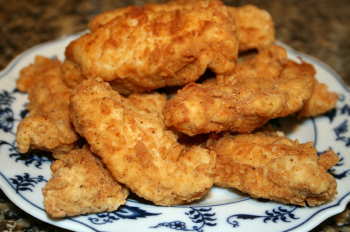 - Place coated chicken in the hot oil and brown on all sides. Reduce heat to medium low continue to cook until no pink in the middle and juicys run clear about 25 minutes.